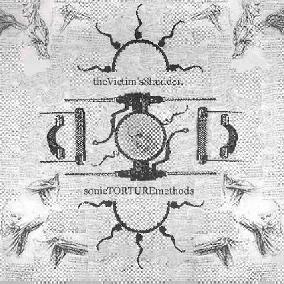 The Victim's Shudder - "Sonic Torture Methods"
I know what you’re thinking... and it doesn’t sound at all like that. My first instinct is to lump this in with the music/lifestyle crowd. Like the Mods, the Goths, the Death Metal-ers, the list goes on and on. I even thought about dismissing it all as trying too hard, especially with a name like that. None of that worked. I admit I’m not crazy about the project name or CD title (remember, I’m old). This music was created by Darin Winn, with ethereal vocals by Diana. It is bleak and dark. It’s also a bit more orchestrated than the average ambient, so it can’t be lumped in there. And while it’s a little dark, it’s never really scary, overpowering, or nightmarish. One thing that is interesting, is that Darin likes to use lots of voices moving around in the background. Everything from Diana’s beautiful vocals to chants, processed “dark” voices, whisperings, and samples. It does give it a unique character. Personally, I think this one is more for the Dark Music crowd. However, if you’re expecting dark musical insanity, based on the title, you will be disappointed (try Devil Doll). For more information you can visit The Victim's Shudder web site at: http://thevictimsshudder.cjb.net.